No matter where a piercing is located on your body whether it is on your tongue, ear, nose, lip, navel or another part of your body it is a must to take care of it. Most people consider their body piercing a form of artwork. Having certain areas of a body pierced is a way for individuals to show off their sense of style whereas other people have piercings to beautify their body. Whatever your reason is for having a piercing there is one major factor to keep in mind. For you to enjoy your body piercing you must take the necessary steps for proper piercing aftercare. The aftercare for your piercing should be taken seriously. The piercing is going to need attention and commitment, if you slack from taking care of the piercing you may cause infection which leads to the removal of the jewelry piece. When cleaning your piercing, it is mandatory to wash your hands thoroughly first, preferably for at least 2 minutes. Never touch the jewelry or your pierced area with dirty hands. Then you saturate the pierced area with H2Ocean which is a cleansing product that is sterile and environmentally safe. It comes in a spray form specifically for piercings and simple to use. Gently wipe away any plasma or dry blood that has gathered around the pierced area. The next step is to easily move your piercing in and out to make certain it is thoroughly clean. Once that is finished, you will rinse the area with anti-bacteria soap, pat dry with a clean, soft towel or paper towel. It is very important to remember one key factor when it comes to a piercing and that is do not slack from piercing aftercare. You must be consistent in cleaning the jewelry piece and the pierced area at least twice a day. Neglecting aftercare is only going to prolong the healing procedure and increase the chances of infections to arise. In addition, you want to avoid exposing your new piercing to chlorine water, salt water and sweet water. 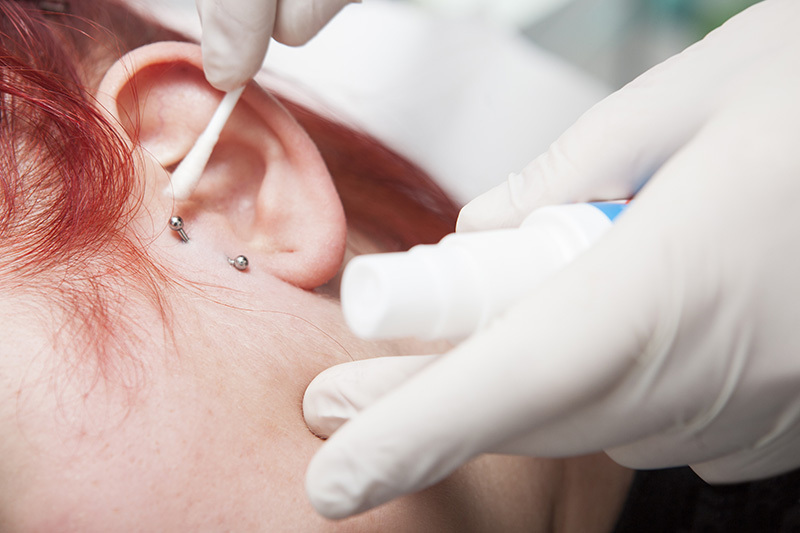 To ensure that the piercing is receiving the right type of care you need to use quality piercing aftercare products that is offered by a well-established online body jewelry boutique. For more information or to order your piercing aftercare products visit BodyJewelry.com today.